Konvertiert Map datei von Tiled 0.6.1 in eine einfache Textdatei und in eine Bytedatei. Loader für .d2ma ist in der Liesmich.txt enthalten. GoldCoins: Deine Aufgabe besteht darin, alle Münzen in einer vorgegebenen Zeit einzusammeln. Gesteuert wird deine Spielfigur mit den Pfeiltasten. Mit der Leertaste kann eine Bombe gelegt werden. Lies "Readme.txt"
A work in progress of a "yawn" breakout clone.If anyone could supply more level designs I would be very grateful. 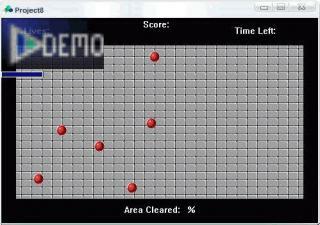 It's basically just a tech demo of full screen blurring and interactive backgrounds as used in Smayds' Vec2 game e.g. So if anyone tells you GLBasic has no power, show this. This game was developed by using GLBasic (www.glbasic.com) for the 10th LUDUMDARE 48h contest with the theme "chain reaction". Aim: Move at minimum 50% of the gray crabs from the trap to the ocean by controlling the red hovercraft with the mouse. 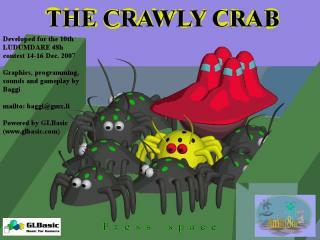 Kill the yellow (diseased) crabs by contacting them with the red hovercraft while pressing the left mouse button. Ein Mini-Spiel bei dem man die Sophie finden muss. Für meiner kleinen Tochters GP2X. [en] It's a simple game where you have to find Sophie (the sounds are in German, but anyway). I wrote this for my little daughter's GP2X. Light green is on,dark green is off.Clicking on a light toggles it's state.The object of the game is to put all lights off.There are 10 levels at the moment,with more to follow. Still a lot of work to do. Einfaches GP2X Spiel für 3-6 Jährige, wo man verschiedene Sachen zuordnden muss. Hi! Use your mouse spin: The space bar or 0 on num pad hold: 1, 2, 3 on keyboard or on the num pad the "multi" starts only, if you have more than rows! klick on the sybmol, what you want! multi = last win * symbols on the screen That's all! Enjoy and have fun! W.
Jezzball was that old Win95 game. This *clone* allows you to set the number of balls and their speed - then run it and off they go. Two-player game where you control a ship flying around a sun whilst attempting to destroy the other player's ship. 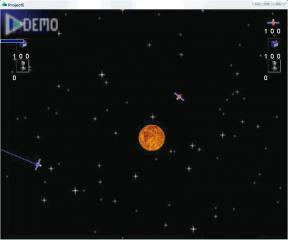 It's a clone of the popular Linux game KSpaceduel, slightly changed. 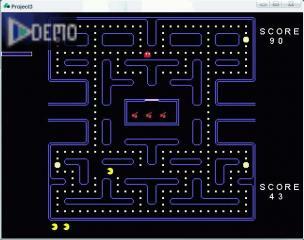 This Pacman clone is different in that it is a two-player game, with one player controlling a ghost, the other controlling Pacman. All written in a mere 666 commands - a tribute to GLBasic's power.